Large, quality fossil specimens reveal how ancient creatures obtained their food, survived extreme environmental conditions, and defended themselves and their young from predators. When purchasing fossils to be distributed at workshops, fossils shows, or on the web, we have set as our goal to acquire specimens that reveal their former lifestyles, but do not break potential purchasers’ budgets. Comments from purchasers and our rating with the BBB have proven that we successfully meet these goals. about 11,000 years ago. They were reintroduced by Spanish explorers in the 1500's. ​they would die of starvation. were named for Christopher Columbus. 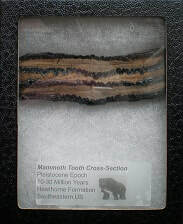 Mammoth Tooth. Cross-section housed in a plastic container. Equus phalanges, i.e. toe bone. North Sea. ~ 0.5 - 1.0 lb. Very small. ~ 0.1 lb. ~ 1.5 - 3.0 lb.